WASHINGTON, DC -- The U.S. will move 150 tanks to Europe for training American troops there as a response to the continuing crisis in Ukraine, according to Reuters. U.S. Army tanks will move to Europe to counter the growing threat in Ukraine and from Russia, the U.S. commander there said. A NATO soldier takes part in a battle conducted exercise called "Saber Junction Exercise" at the military ground in Hohenfels, Germany, Sept. 8, 2014. An unspecified quantity could be placed in Poland, Romania or the Baltic states – Latvia, Estonia and Lithuania -- seemingly to shore up NATO’s defensive capabilities against the Russian Federation, which NATO accused of directly fostering the conflict between the military and pro-Russian separatists in Ukraine. Lt. Gen. Ben Hodges, commanding general of the U.S. Army Europe, called the initative “operation Atlantic Resolve” and said it would allow the U.S. to defend NATO border states at a moment’s notice. At least a third of the new force will remain at training bases in Germany, he said. NATO, which is made up of European countries, Canada and the U.S., already has moved military assets like F-16 fighter jets to the Baltic countries at their request over their growing concerns about Russia. 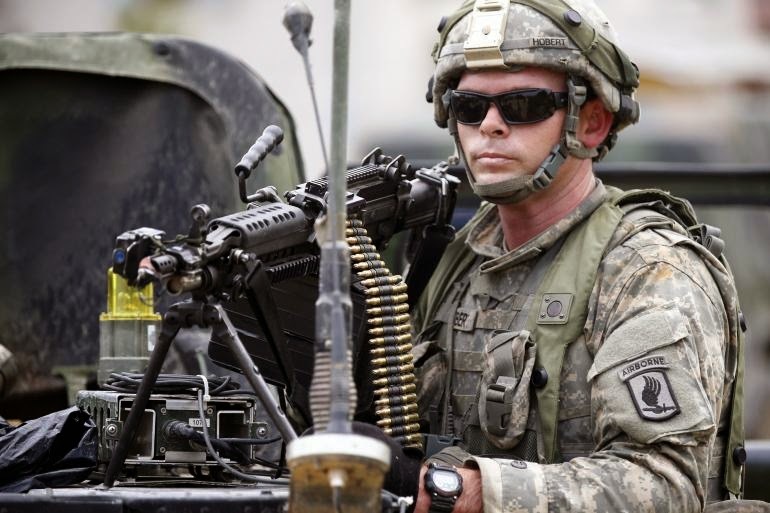 The U.S. Army Europe, which is separate from NATO, has around 29,000 personnel in its ranks. In total, NATO has around 3.3 million soldiers on active duty, according to the Council on Foreign Relations. This month, the Russian Security Council deemed NATO the country’s biggest threat in a military doctrine that set the stage for a major upgrade to Russia’s military in 2015. Part of that upgrade will be to its nuclear forces equipment and will go toward expanding its capabilities in the Arctic, where vast energy reserves lie, according to Agence France-Presse. Russian leaders strongly opposed any troop movement near its borders and has answered with troop buildups and exercises this year. Since the escalation in Ukraine from peaceful protests in favor of moving toward the European Union to all-out territorial war in spring of this year, Russia has run dozens of missions with its aircraft near its NATO neighbors and even near U.S. airspace. Russian threats to counter NATO with its own military build-up is simple bluff and bluster. Any military build-up is directly related to a country's economy. Russia is already several years behind in its strategic build-up of forces because Ukraine has embargoed any further shipments of military parts to Russia. According to some estimates, it will take at least 3 years and substantial resources to duplicate domestically what they lost in Ukraine. Furthermore, the Russian economy, despite all the deceptive disinformation and bluster of its spokesmen, is already hemorrhaging, and may need life-support in the coming year if the sanctions are not removed and oil and gas prices fail to rebound.